That’s why, several years ago, we developed a Bible curriculum specifically for homeschoolers. We invite you to take a look! Children who begin studying the Bible in first grade will have thoroughly discussed God’s Word four times before they graduate from high school. Many homeschooling curriculum seemed to follow a haphazard approach to learning the Bible, leaving possible gaping holes in our children’s knowledge of God. We couldn’t find a homeschooling company that followed a chronological approach to Bible study. Why was this important? If our children didn’t come to a clear understanding of God’s nature and character, their own sinfulness, helplessness and hopelessness, and Christ’s all-sufficient saving work through His death, burial, and resurrection, then how could they understand God’s plan of salvation and have certainty of their faith in Him? Many homeschooling curriculum fail to teach the Bible consistently as one book, just as God has progressively revealed it to us. Instead, we saw hit-and-miss teachings, full of cute Bible stories and character-training devices. We were convinced that if our children came to know and understand God’s plan for their lives as revealed in His Word, they would develop Godly character as a natural by-product. Since the majority of Christian teaching emphasizes individual doctrines of the Bible rather than presenting the Bible as one complete, interdependent revelation of God, the result is often heresy, as well as the misinterpretation and overemphasis of certain Scriptures. How many lifelong church members still do not know the Bible as one book? How many have even read through the Bible in its entirety just one time? We didn’t want this for our children. Finally, when we found a homeschooling curriculum company that seemed to meet our goals, it was written for just one child to use, usually in a classroom setting. We were searching for a curriculum that we could use to teach all of our children, all at the same time. That’s why we developed our own homeschooling Bible curriculum. We offer a 3-year plan to studying the Bible. 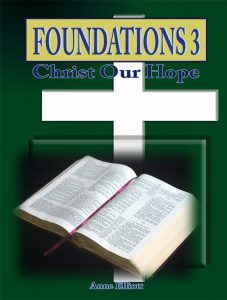 Foundations 1 will study an overview of the Old Testament, preparing your children for the coming of Christ by presenting them with a clear picture of God’s nature and character, as well as the nature and character of sinful mankind. They will learn about the necessity of the Law and about God’s plan to provide a Savior from sin. They will have a clear understanding of their place in God’s plan. Foundation 2 will study the Gospels and Acts, as your children will see how Christ was the fulfillment of all the Old Testament. They will learn how the early church was founded and how God has continued to build His church. 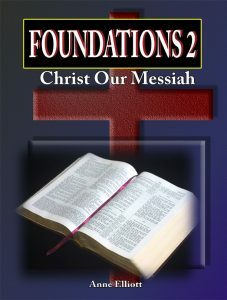 Foundations 3 will continue the study of the New Testament by surveying the Epistles and the book of Revelation. Your children will now have the necessary framework to study systematic theology as well as character traits that are taught in the Epistles. We will follow a chronological approach to the Bible. 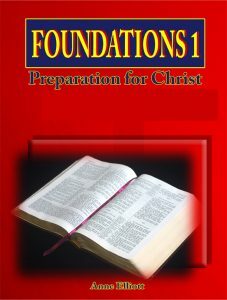 We strongly urge you to start with Foundations 1: Preparation for Christ (Old Testament), no matter the ages of your children, so that a firm foundation for Biblical understanding will be laid. We will teach your children how to study the Bible for themselves, using inductive and deductive methods. Your children will learn, through daily use of the Scriptures, how to find Scripture passages, understand God’s Word for themselves, and apply it to their daily lives. Your children will also commit large portions of Scripture to memory, hiding God’s Word in their hearts so that they will not sin against God. We will have your children study through the Bible once every three years. If your children happen to start using our homeschooling curriculum in kindergarten or first grade, they will completely study the Bible four times before they finish high school. You don’t have to worry about boring them, however. We offer learning activities suited to many different ability levels, so that all of your children will be challenged. We think you’ll love our curriculum, especially if you’re teaching several children at once. You will all be memorizing together, studying together, and applying God’s Word together. We’ve included easy lesson plans so that Mom doesn’t have to spend much time in preparation. In addition, each year’s plan requires only a handful of additional resources, so you’ll save money! It’s cost efficient! We offer it to you as an inexpensive e-book download, or you may purchase it as a printed, wire-bound book to save the cost of printing it yourself. It’s all inclusive! You can buy more resources if you’d like, but rest assured that our curriculum is a packed program all on its own. You are homeschooling only one child, and he is just starting first grade. In this case, you would use Foundations 1 for first grade, Foundations 2 for second grade, Foundations 3 for third grade. When your son starts fourth grade, you would go back to Foundations 1 and complete some of the more difficult assignments. You would continue to cycle through the curriculum, potentially studying the entire Bible four times before your son graduates! Wow! You have many children, ranging from high school age to preschool. You’re a busy mom, so you’ll love the flexibility of our curriculum. Each of your students will be studying from the same lessons. You should all start on Foundations 1, no matter what grade your children are in. Young children will listen as you read aloud from your Bible. They can complete the optional coloring pages and memorize the Bible verses. Older children can do the optional activities, enjoy weekly Bible drills, and memorize longer sections of Scripture. High school students can outline entire books of the Bible, read supplemental books, and learn how to study the Bible for themselves. Meanwhile, Mom still has very little preparation to do, and it didn’t cost you any more money! Frequently Asked Questions – Please read! IMPORTANT NOTE: The coloring pages referenced in our curriculum are available free of charge at Calvary Chapel. No membership to their site is required to download the files. Contact us if you need help. We offer a 3-year plan to studying the Bible. Lesson plans include 36 weeks (180 days).